Inspiration is all around us. These are a few of the things that zip my coat, float my boat and find my lost TV remote. [this picture] is of a Promotion of mine at Feltham Assembly Rooms, Felthem, Middlesex. There you can see a Tag match with Dino Scarlo and his Dad against Bob Taylor and Paul Knight and it bought the house down. They were really good and got some terrific heat going there the audience loved it. One problem was that it was a charity do and the Mayor and his Lady were there and I was on with Jim Martell from Engelfield Green and during the bout he aimed me through the ropes and I ended up going over and getting ny neck caught between the middle and top rope. As I am hanging there and they are trying to get me out the Mayoress fainted and luckily had a St Johns Ambulance chap there on duty who managed to bring her round and sort it out, and the show went on after they left. The one good thing there was that my pal a Publican got the license to run the bar there and we made a nice few bob that way, including everyone getting paid. We raised a fair sum and it was later presented to the Mayor but I have lost the newspaper cutting of it. 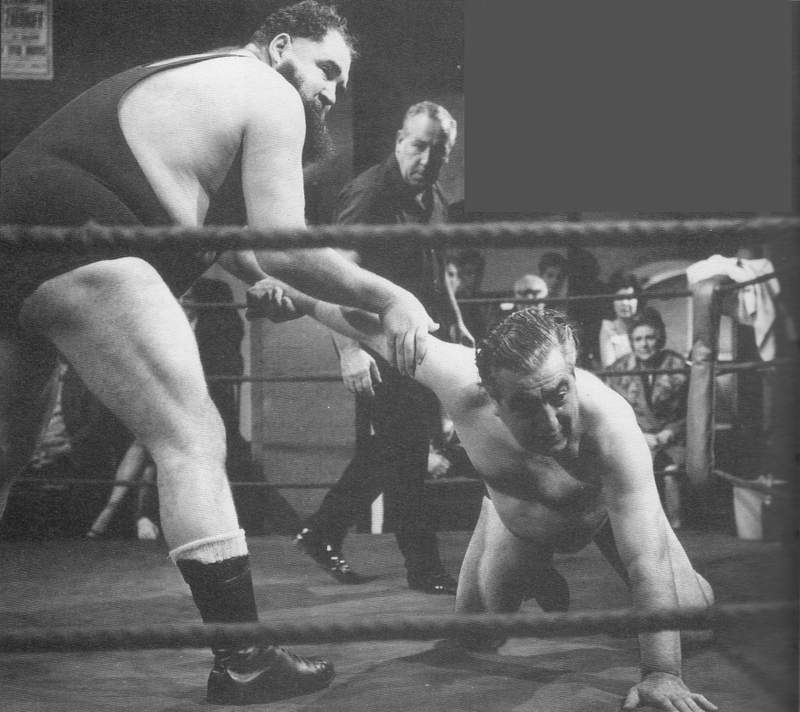 Above image and copy is from Rik Sands, on the British Wrestlers’ Reunion page – well worth going there, it has some great old photos and stories. Alignment – the personality type used by wrestlers. For example, if they are a babyface, they are said to be “face-aligned”. See also heel and tweener. Angle – a fictional storyline. An angle usually begins when one wrestler attacks another (physically or verbally), which results in revenge. An angle may be as small as a single match or a vendetta that lasts for years. It is not uncommon to see an angle become retconned due to it not getting “over” with the fans, or if one of the wrestlers currently involved in the angle is released from his contract. Bump – when a wrestler hits the mat or ground. A flat back bump is a bump in which a wrestler lands solidly on his back with high impact, spread over as much surface as possible. A phantom bump occurs when a wrestler or referee takes a bump even though the move they are selling was visibly botched or otherwise not present. Phantom bumps are most commonly performed when the offensive wrestler is new. Burial (or Bury) – refers to the worked lowering (relegation) of a popular wrestler’s status in the eyes of the fans. It is the act of a promoter or booker causing a wrestler to lose popularity by forcing him to lose in squash matches, continuously, and/or participate in unentertaining or degrading storylines. It can be a form of punishment for real-life backstage disagreements or feuds between the wrestler and the booker, the wrestler falling out of favor with the company, or the wrestler receiving an unpopular gimmick that causes him to lose credibility regardless of win-loss record. It is also a result of a company seeing a wrestler as having no potential or charisma. The term can also be applied to a wrestling company that jumps the shark, rapidly loses ratings, fans, and finally becomes bankrupt. Some notable pro wrestling personnel that are notoriously synonymous with burying include Triple H, Kevin Nash and Hulk Hogan. Carny – a language used by wrestlers to talk to each other around people not associated with the business so they would not understand what they were saying, often used to keep the secrets of the business (see kayfabe). Claret – to draw blood. Especially in UK Professional Wrestling. A promoter might say “I want some claret in this match”. Finisher – a wrestler’s signature move that leads to a finish. Some Finishers Include Randy Orton‘s RKO, Eddie Guerrero‘s Frog Splash, John Cena‘s Attitude Adjustment, or Diamond Dallas Page’s “Diamond Cutter” This can be a unique move entirely (like Razor Ramone’s Inverted Crucifix) or a known standard move with a new name. A “Finisher” can also be a submission like the Sharpshooter or a flying maneuver like the Frog Splash or the West Coast Pop. Flair flip – a move, popularized by Ric Flair, where a wrestler is flipped upside down upon hitting the corner turnbuckle and often ends up on the other side of the ropes on his feet on the ring apron. Flair flop – also a Ric Flair specialty, it involves falling flat on one’s face as a delayed sell of an opponent’s offense. Kayfabe – term used to describe the illusion (and up-keep of the illusion) that professional wrestling is not staged (i.e. that the on-screen situations between wrestlers represent reality). Also used by wrestlers as a signal to close ranks and stop discussing business due to an uninformed person arriving in earshot. The term is said to have been loosely derived from the Pig Latin pronunciation of the word “fake” (“akefay”). Luchas de Apuestas – with the importance placed on masks in lucha libre, losing the mask to an opponent is seen as the ultimate insult, and can at times seriously hurt the career of the unmasking wrestler. Putting one’s mask on the line against a hated opponent is a tradition in lucha libre as a means to settle a heated feud between two or more wrestlers. In these battles, called luchas de apuestas (“matches with wagers”), the wrestlers usually “wager” either their mask or their hair, though there are wagers involving other items as well. While the culture of Luchas de Apuestas is unique to Mexico, matches of this sort do occur elsewhere. A famous example in the United States took place during the 1977 promotional war in Memphis. Bill Dundee and Jerry Lawler engaged in a feud which lasted for several months. The blow off match, a hair versus hair match in which Dundee lost his hair, did not end the feud. The following week, Lawler put up his hair against the hair of Dundee’s wife Beverly and was once again victorious. Parts Unknown – billing a wrestler as being from “Parts Unknown” (rather than from his real hometown or another actual place) is intended to add to a wrestler’s mystique. In some territories, the phrase commonly was applied to masked wrestlers. In the post-kayfabe era, it is used less and less, and usually with a certain air of levity. Sometimes, wrestlers can hail from other, abstract places; for example, the tag team of Deuce ‘n Domino hailed from “the other side of the tracks”, the Dudley family who came from “Dudleyville,” The Boogeyman who came from “the bottomless pit,” Shark Boy is billed from “the deep blue sea,” Eric Young who, for a time, came from “Freedomville, USA,” and “Now residing in an undisclosed location,” and Judas Mesias, who came from “The Depths of Hell.” In an interview, Chris Jericho described it as a city in central Wisconsin. Potato – striking or hurting another wrestler more than necessary. A wrestler who endures one or more potatoes is likely to potato the perpetrator back, which is known as a ‘receipt’. Suplex – the move consists of one wrestler picking up his or her opponent off the ground (or mat) and then using a large portion of his or her own body weight to drive the opponent down on the mat. …it’s gonna be bigger than the WWF. Actually it’s a scene from Gummo. Would 2012 be better in black and white? The 1948 Summer Olympics, officially known as the Games of the XIV Olympiad, were held in London. After a hiatus of 12 years caused by World War II, these were the first Summer Olympics since the 1936 Games in Berlin. The 1940 Games had been scheduled for Tokyo, and then Helsinki; the 1944 Games had been provisionally planned for London. US pole vaulter Guinn Smith (C) attempting to break world record. Your Majesty: The hour has struck. A visionary dream has today become a glorious reality. At the end of the worldwide struggle in 1945, many institutions and associations were found to have withered and only the strongest had survived. How, many wondered, had the great Olympic Movement prospered? At 4pm, the time shown on Big Ben on the London Games symbol, the King declared the Games open, 2,500 pigeons were set free and the Olympic Flag raised to its 35ft flagpole at the end of the stadium. The Royal Horse Artillery sounded a 21-gun salute and the last runner in the Torch Relay ran a lap of the track – created with cinders from the domestic coal fires of Leicester – and climbed the steps to the Olympic cauldron. After saluting the crowd, he turned and lit the flame. After more speeches, Donald Finlay of the British team (given his RAF rank of wing-commander) took the Olympic Oath on behalf of all competitors. The National Anthem was sung and the massed athletes turned and marched out of the stadium, led by Greece, tailed by Britain. Thus were launched the Olympic Games of London, under the most happy auspices. The smooth-running Ceremony, which profoundly moved not only all who saw it but also the millions who were listening-in on the radio throughout the world, and the glorious weather in which it took place, combined to give birth to a spirit which was to permeate the whole of the following two weeks of thrilling and intensive sport. Turkish heavyweight champion Ahmet Kirecci (C) being hoisted to shoulders of admirers after winning finals of Greco-Roman wrestling event in Olympic Games. High diving winner Vicki Manolo Draves. Jamaican athlete Herb McKenley (C) standing on track. Tom Rosenthal – How have you been? Antarctica. And it’s a kind of paradise. Night sky time lapse corrected to show earth moving rather than stars. Gorgeous.